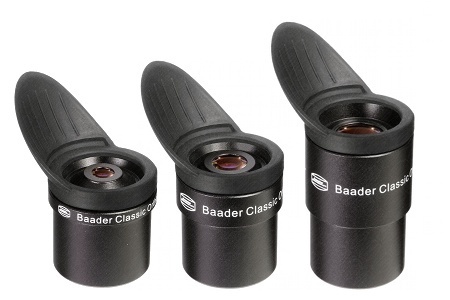 Baader Classic Ortho & Plossl Eyepieces 1.25"
These new premium quality orthoscopic eyepieces from Baader are a worthy replacement for their earlier Baader Genuine Orthoscopic. Baader also offers a Classic 32mm Plossl which when used with the three orthos produces a variety of useful and complimentary magnifications. The 6mm and 10mm Classic Orthoscopics incorporate an inset volcano-top shape that provides eyelash clearance and comfortable folding rubber eyeshields. The 18mm Classic Orthoscopic and 32mm Classic Plossl also incorporate winged rubber eyeshields. Actual Field Of View (of orthos) has been extended to approx 50-degrees for easier target location. Finely polished glass with multi-layer High Transmission broadband optical coatings. Proper internal baffling and blackened lens edges for maximum light transmission and contrast.